I know Apple cares about my experience as a customer beyond just the UX of an app or the physical design of a device or even the packaging. It's this care about me, my privacy, me experience that keeps me as such a loyal fanboy. I have been posting a lot on LinkedIn these days and LinkedIn extended an offer for a free trial of LinkedIn Premium. The offer said, “After your one month trial, we will automatically charge you….” I figured I wouldn’t do it. It seemed obvious it was going to require my credit card and then the only way I could cancel would be to call them. That is the standard, user-hostile approach to subscription retention. Even in my teenage years, as someone who DESPISED calling on the phone, I was able to work up the courage from time-to-time to do the free AOL trial and then end the month with the 20 minute phone call to cancel. For the LinkedIn offer I curiously tapped and saw that it was an App Store subscription. “Oh, done!” I thought. For an App Store subscription I don’t have provide LinkedIn my credit card. I was able to do the subscription, and then immediately after the trial started I could cancel the subscription with Apple without ever having to call anyone. I get to experience this trial and I have 100% faith that I’m not going to get charged because I forget to cancel later. Thanks Apple! Love it. It's an example Apple at it's greatest. Find a bad user experience, in the case a very common hostile user experience, and banish it. You want to play in the App Store ecosystem of subscriptions then you have to play fair with your consumers. When interviewing candidates, I'm surprised how few (especially engineers) do not ask questions back to me to help shape their answers. When I ask most people to perform a task in an interview, they expect I've done a good job thinking through what I want to ask them, and jump into performing on the task. If you're doing an interview, one of the starting points for any problem solving excersize is to gather information and confirm that you've gathered it correctly. This is the true problem solving approach and tends to impress interviewers, even if they don't have any more clarification to give. One day I was interviewing someone and after my first task she paused, "okay, we'll let's clarify requirements before we do design." She then proceeded to ask me various questions about the organizational hierarchy and desired performance characteristics. I tried to play dumb, but she was so good at asking she got everything out of me and just had to do the one design which took far less time than me stumbling out each new requirement. I took that to heart in future interviews that I did myself - when given a task to complete I now pause and ask clarifying questions before proceeding to create the answer. I hope that's helped me too. P.S. I hired her. One of the best engineers I ever hired. Well that was nice! I was having this problem where I couldn't get the latest update to OSX Mojave installed on my laptop because I didn't have the space. I've spent a lot of time eyeing iPhoto Library.migratedphotolibrary which seemed like it was taking up 52GBs of space, but in theory that is just duplicate spaced used by the new Photo Library with both files hard linking the same data on disk. I finally took the steps to copy the migratedphotolibrary off the internal hard drive to the Drobo and the delete the the bundle and... yep, I got 52GBs of free space back. So it looks to me like some time during the migration from laptop to laptop some copy operation changed those hard links into duplicate files. At least I've got plenty of space now, right? Update: It was pointing out to me the most likely culprit was the conversion to APFS. SixColors does an annual Apple report card, and while I'm not a member of the panel, as a card-carrying Apple fanboy I felt inspired to run through the list myself and do my own report card based purely on my experiences ignoring that other's experiences may different from mine. I'm in the market for a new headless macOS server at home and the new 2018 Mac mini seems the perfect fit. One of the main things my Mac server does is re-encode video and even though the graphics card is terrible, it uses the T2 coprocessor for extremely fast H265 encoding so I think it's good? The only thing that stopped me from buying a Mac mini is that I'm pretty confident an ARM-based Mac is coming in the next 1-2 years and since I keep my servers for 5-10 years I'll be sad to have the last great Intel Mac mini instead of the first great ARM Mac mini. Mrs.Chaos' old MacBook Pro is so old it couldn't upgrade to Mojave and that's my trigger to upgrade. There was no clear winner for her needs in the MacBook lineup, just trade offs. I went with the 2018 MacBook Air for her and her impressions are that TouchID is great, Dongle Town is terrible, and not much beyond that. She doesn't type enough to form strong opinions on the keyboard and I encouraged her to put a cover over her keyboard to help reduce debris ingres. I love my iPhone XS Max getting the big size and I have only the smallest nit-picky things about it that bug me - Apple is firing on on cylinders with these phones. Why is there not a landscape springboard like my 6s+ had? I use my phone like a micro-iPad in landscape mode and it's a major pain each time I swipe up to home screen and it only shows up portrait. Or if it locks when I'm in landscape, then the swipe up fails because FaceID only works in portrait on the phone. I would love Picture-in-Picture support on that bad boy. It has the pixels to have a little PiP window it and would be amazing. 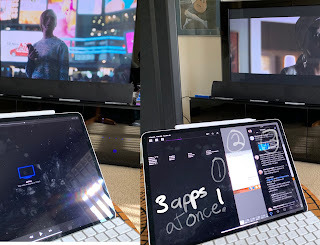 Finally it would also be amazing if the Apple Pencil worked on it so that when I'm using Screens to remote connect to the Mac I could use it as a precise pointing device instead of my silly capacitive sensor. I moved over to an iPad Pro lifestyle (plus macOS server) with 12.9" model for personal use and it’s great all around. I can do everything that I want (minus a few nitpicky things). Unfortunately, I have three struggles using iOS for work. My first struggle is multitasking isn’t as efficient as I need it to be. It’s too slow for me to swap between email, chat, work, etc. I’m a massive multitasker, so the change of “okay this task will run for 1m-5m so I'll check email, chat, etc. and keep peeking back at it” is just too slow. 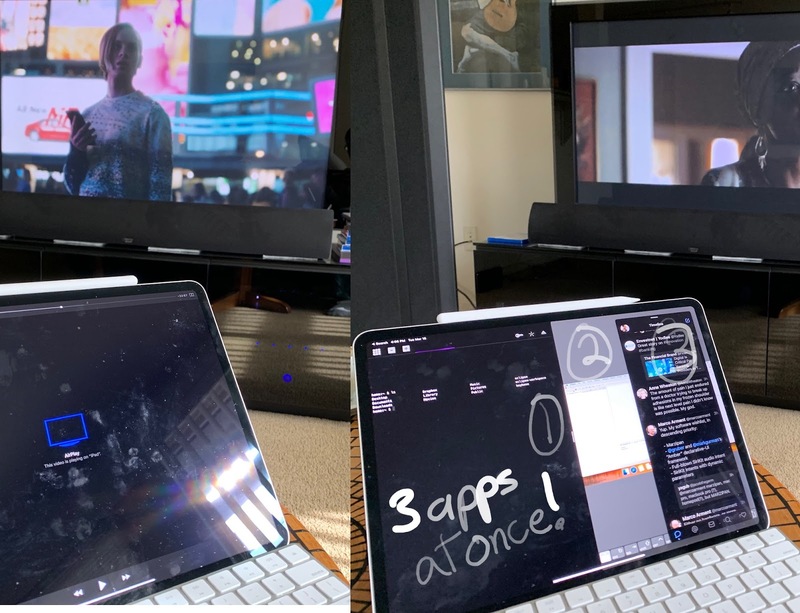 The second problem is that I do a LOT of screen sharing for work and as of right now, none of the iPad meeting apps take advantage of ReplayKit to let you share your screen - hopefully someday. For screen sharing I typically still do the task on my iPad and use Reflector to screen share it through my desktop. The third problem is that I manage a team of people using Macs, so it doesn't make sense for me to build complicated Siri Shortcuts and workflow paths on iOS, because the rest of the team won't take advantage of that. Is it better to use an iPad or a MacBook Air? I like that I can use the iPad without the keyboard for reading or other things. The winning reason in my personal life is my iPhone and iPad are basically the same so I know while I can do all this big work on my iPad I can also do the same job on my iPhone when needed. I'm don't want tabletOS that so many people are calling for, because I think it will make this statement less true. I have a stand to raise the iPad to the ergonomically correct height, but it's amazingly uncomfortable to reach up and touch the screen at that height so I generally plug the iPad on my desk with the keyboard in the tray. I have nothing more to ask of my watch at this time. The only thing I wear more than my watch is my wedding ring. 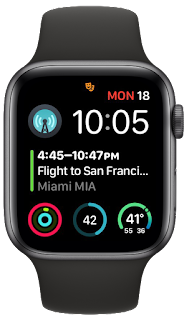 I use it for notification triage, to see what events are next in my day, the weather, and lots of Siri to either run HomeKit scenes, start times, or trigger Siri shortcuts on my phone. I doesn't do much, but it does them great. It’s fine I guess. I'm not the typical user. 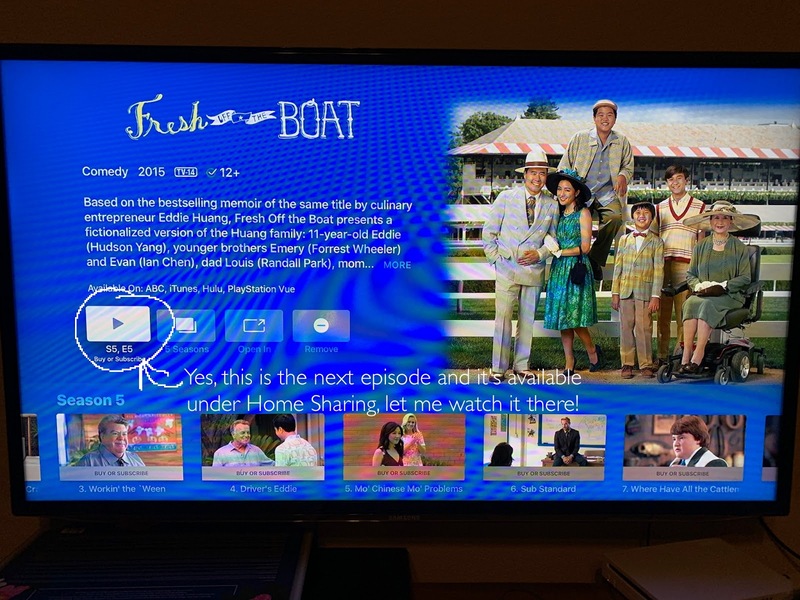 All of my movies and shows are in iTunes on my macOS home server and I use Home Sharing to stream my content. The frustration is the UI to watch TV Shows through Home Sharing is significantly worse on the 4th generation AppleTV compared to my third generation (tvOS 7.2.2). 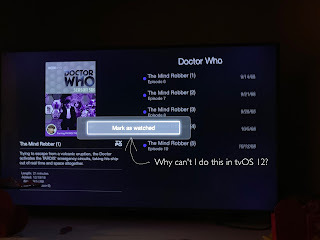 You can’t “Mark as Watched” on the latest one while looking through Unwatched shows (though you used to). 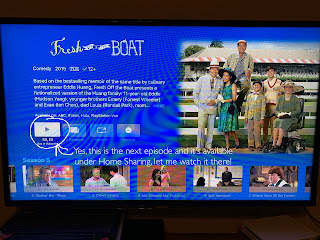 When you watch an episode in Home Sharing it *DOES* mark it as watched in the TV App, but the TV App doesn’t care at all about checking if the latest episode is available in Home Sharing. So when "Up Next" tells me about the next episode, I have no way to jump to steam it. I get most people don’t do their TV this way. I understand the solution to my woes is to go all-in with Plex, but I'm an Apple fanboy so I try hard to stay with the standard apps. The remote doesn't bug me the way it bugs others. I love that Apple TV connects to my AirPods so that I can start a show and then wander around the house with the sound in my ears. Also super awesome for watching shows after the kid's bedtime or if I want to watch a show on the TV while Mrs.Chaos watches one her laptop. Apple, when are you going to have a "kid mode" for the TV so that I can restrict content when my kids are flipping through the list of available movies and shows? The Apple services I use are rock solid for me and I love them. Apple Messages, Apple FaceTime, Apple Pay, iCloud Drive, iCloud Photo, Find My Friends, Apple Maps, Apple News, maybe more? The big change to my services usage this year is when we got Mrs.Chaos a new 2018 MacBook Air it was far more cost effective to put the family photo library into iCloud Photos (pay for 2 TB family plan) than to pay for a 1 TB SSD in the laptop. So now all the photos are up there automatically without flaw (and they sync to the home server so they can be backed up to Backblaze). I’m frustrated there is no reasonable family option for iCloud Photos to give us both access to the family iCloud Photo Library. Instead every once in a while Mrs.Chaos plugs in my iPhone to her computer to takes photos off of it. Apple Messages remains the way I want to talk with everyone. I don’t even pay for an SMS plan on my phone. When my Android friends want to SMS me they do so through my Google Voice phone number and I use that app for it. I would love for Apple to bring out Messages for Android, but I assume they don't because someone will come up with an Android hack and the headline will read, "Apple Messages Hacked/Insecure!" When buying, if I ever see the NFC logo, I use Apple Pay. Something I find funny is that At the Apple Store I used to pay with credit card it would attach to my customer profile so they would email me a receipt. When I use Apple Pay they ask me for my email address because it's a random number so Apple can't correlate it to my account. I like that Apple eats its own dog food about that at the retail store locations. For peer-to-peer I want to use Apple Pay, but most people would prefer I use Venmo. I don't use Apple Music right now, because I get Amazon Music for free with my Prime account and it's good enough for me. I'm not a music aficionado these days. I am very interested in 2019 to see what they offer, which I assume will be a combination Apple Music + Apple Video service. HomeKit is how my home is connected: lights, cameras, garage, fans, coffee machine, and locks. With HomeBridge [https://homebridge.io] it feels like an amazing open source project because I was able to write a plugin for my TCP Wireless lights to get them connected. The setup dance with HomeKit is by far the best because the Home App (and Apple) have a standard way to manage the setup handshake to get the device onto your Wireless network and Apple requires devices can be setup using only the Home App (you don't need to install the 3rd party app). The privacy side is solid with my two HomeKit cameras using 100% local storage (nothing in the cloud) and I can watch them outside the network with the iCloud/Home Hub handshake. Apple HomeKit is convenient and private. I share my Home with Mrs.Chaos so all the setup I've done on my phone automatically works on her phone (and our iPads and our Macs and our Apple Watches). It's been a slow road for Apple to get to a point where HomeKit feels rock solid, but for me this is the year Apple HomeKit has arrived (except for that darn video doorbell). Knock on wood as I've had very few problems over the years. I've had a few under-warranty glitches that were easily repaired. Mrs.Chaos has cracked three iPhone screens (sigh) but Apple comp'ed one replacement and now she has Apple Care. I had a laptop with a battery expanding on it (my current server) and I was honestly shocked that Apple did not offer to comp fixing my fire hazard even after I said, "I doesn't make sense to pay for the replacement." I have never encountered the major bugs that people complain about - so this year's iOS / macOS updates that focused on speed and performance were great for me. I'm interested to think about how Marzipan (iOS apps on macOS) plays out. It is GREAT having the Home app on my Mac and I generally think consolidating these things will be good all around - especially once that ARM Mac comes out, right? I avoid the retail store. Genius Bar appointments are annoying for me - I generally solve my problems myself so I only go to the Genius Bar for warranty replacements and it always take too long and is frustrating. I dislike the idea that I need to wander around and try and flag down a wandering not busy employee to make a purchase. You can buy some (but not all items) yourself on your phone. The last time I went in was to buy an Apple Pencil 2 and I couldn't buy that on the phone, it required an employee. When I got my new iPad Pro this year, I went in to task how to connect my old MacBook Air (USB-A) to my new iPad Pro (USB-C) it took two store employees to embarrassingly tell me they didn't sell the proper dongles to do it and send me to BestBuy. Apple is firing on all cylinders for me. I'm in love with the qualified-self tracking of everything about me - but in addition I have HealthRecords integration with my providers so I can see all of my lab results in a consolidated app rather than bouncing around between Dignity Health, Quest, and Stanford Medical. I'm participating in multiple ResearchKit projects, some specific to my medical conditions. I'm extremely happy to be part of the Apple ecosystem compared the competitors. I think my tablet and phone are the best in the world at this time and I don't see a competitor taking over that soon. Home automation through Apple is simple and private. The services I use are rock solid and I cannot wait for what 2019 is going to bring. 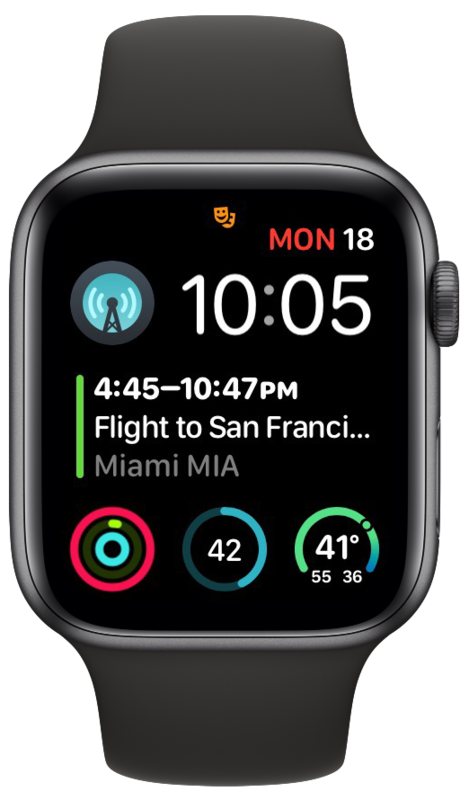 Long term, Apple is slowly transforming from the iPhone company into a media company (Apple Music, Apple Video, Apple News) and a health company (Apple HealthKit, Apple Watch), and a financial services company (Apple Pay, iPhone Upgrade Programs). I think there are great prospects ahead and that I'm going to stay all-in as a card-carrying fanboy. Following people on social media that are aggressive about blocking bullies has enabled me to improve how I choose to interact with people. I follow a select number of minor celebrities on social media of varying histories both trying to combat and activate the illusory truth effect (where hearing something repeatedly makes you believe it). Many of the people I follow are minorities who receive the worst of the internet and are aggressive about blocking people that badger them in any way. I want to interact with them by sending quips, jokes, and other positive things their way and because I know they block so aggressively it makes me think very hard before I hit that send button if what I'm saying is 100% funny without any hint of being sarcastic, mean, unkind, etc. There have been so many times I’ve thought, “this is really funny, but there is just a bit of edge to it that could be misconstrued so I better not reply.” This exposure is making me more thoughtful about what I'm saying, who I'm saying it to, and who else is involved in the conversation that might also see it. So yeah, every time I make a funny comment to one of these people and I get a “like” or reply back I give myself a personal high five. That is how the internet should be and that is why they are here!